I have a post to make about the lovely birthday party I attended in London last night, but after two consecutive nights out and a lot of time spent on trains and buses, I'm too tired to curate the photos and my memories. It will have to wait until tomorrow. Shaggy Pony was a popular subject the last time and since the Friday Five did not move me to response this week, I thought I'd introduce you all to one of the other ponies. This is the pony I call Cousin It. 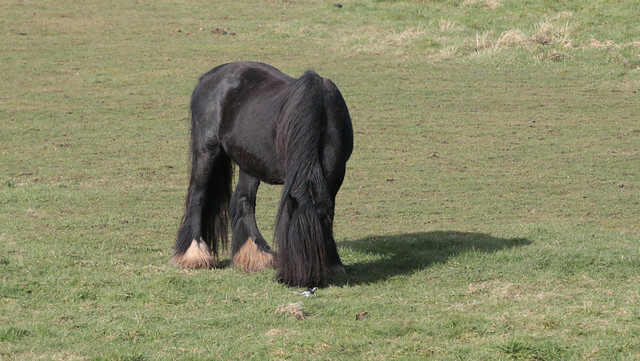 Cousin It is particularly popular with the wagtails (small black and white bird in front of Pony). Every now and then I think I'm going to get a glimpse of Cousin It's eyes through its mane. But no. 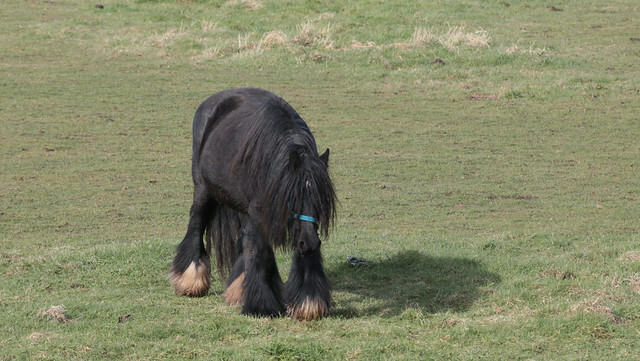 Even in a brisk winter wind, it manages to maintain its title of International Pony of Mystery. This is the pony I call Cousin It. *sporfle* That is perfect and amazing!! Are they vanners? I love their feathery feet so much. Yes, I think they are vanners! It's the shaggiest of all. The rest of them look quite trim and tidy in comparison! ugh I love Cousin It. ...This one, not the other. Not that I actively dislike the oth... Never mind. SO MUCH FLOOF. It was snowing today, and that made it look as if it were covered in icing sugar. Heh.